Our experienced and valuable .NET professionals create robust, customizable and flexible solutions with their diverse skill set. Microsoft .NET technology has deepened its roots in Web Application Development. It deploys model-view-controller (MVC) model that helps developers to build dynamic websites using powerful scenarios. Also, .NET technology helps to refactor the existing application to a brand new application which you can never imagine. 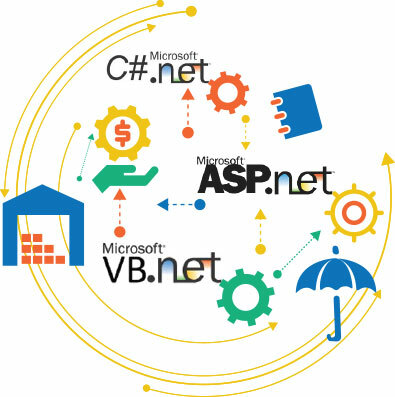 You can enjoy various customized .NET development solutions as the applications involving .NET are lightweight, scalable and are highly secured. Our experienced and valuable .NET professionals create robust, customizable and flexible solutions with their diverse skill set. Beginning with analysis, design, development, testing, deployment and development we ensure the needs are tailored and catered accordingly. We design custom application specific to your business requirement and it gives you abundant advantages in making business very successful and adds value to the company. Custom development solution is the best way to reduce costs and increases the revenue of the company through specific solutions that create new possibilities. Through custom development, we improve productivity, work flow and communication.